Every Christmas I try to find one thing I can make with my children to give to some of the special people in our lives. We usually make that one special thing for many people: neighbors, extended relatives, and friends. 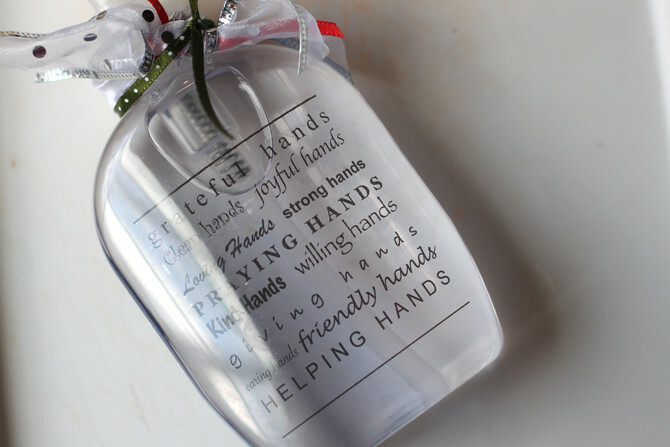 Along with individual gifts that we make for others, making this same one gift for many eases the burden of homemade giving since I only need to come up with that one gift idea once and then just make a lot. I discovered the family soap dispenser idea at my friend, Cindy's home. Every time I've been in her kitchen her own family soap dispenser has caught my eye. I love everything about it. 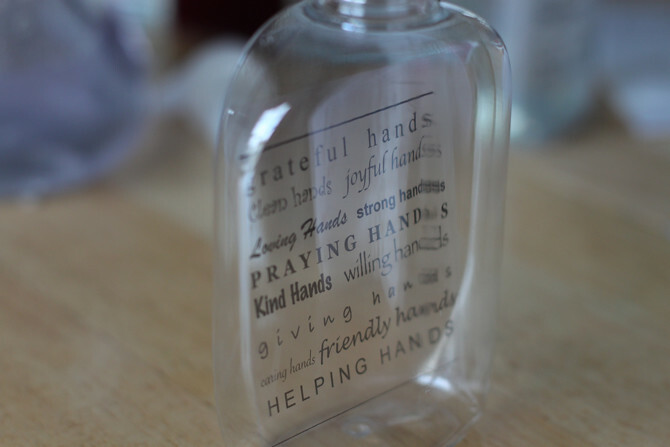 Now that I have one for our own kitchen I think about the words inside the bottle and our family's hands. I've wanted to share it with friends and family this year. And the great part is, you can add to it (with baked goods to a neighbor or relative) or give it on it's own. Thank you Cindy for the idea! This is as simple as simple can be. Here is the text that you can download and personalize. 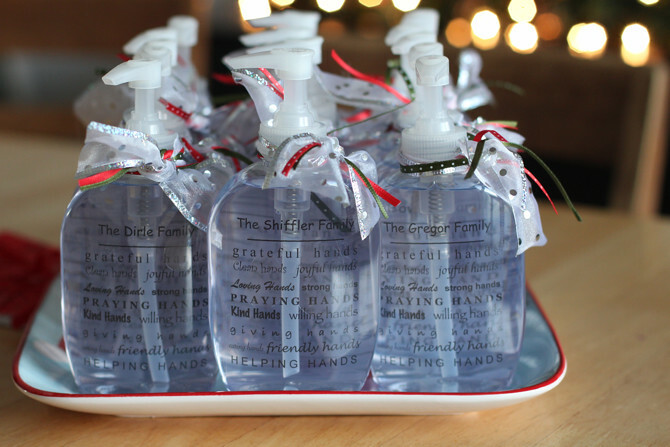 You can add a family's name above the text or simple give a soap dispenser without a name. I did some of both. 1. 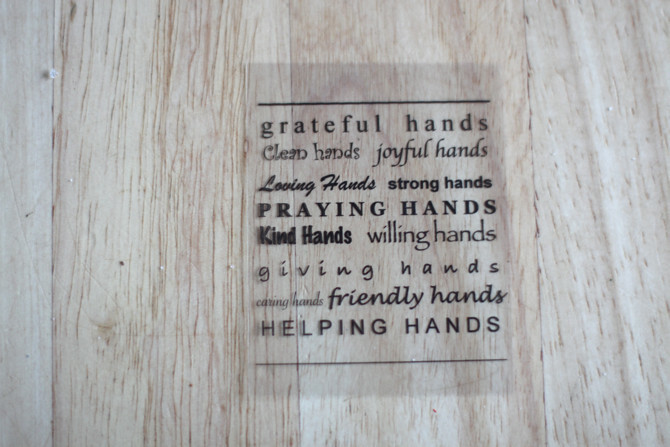 Simply have the text printed at an office store onto transparency paper. A sheet of transparency paper is roughly $1 and fits 2 text labels on it. (You'll see that once you've downloaded the text.) Now cut the image so that it will fit inside of your soap dispenser. 2. 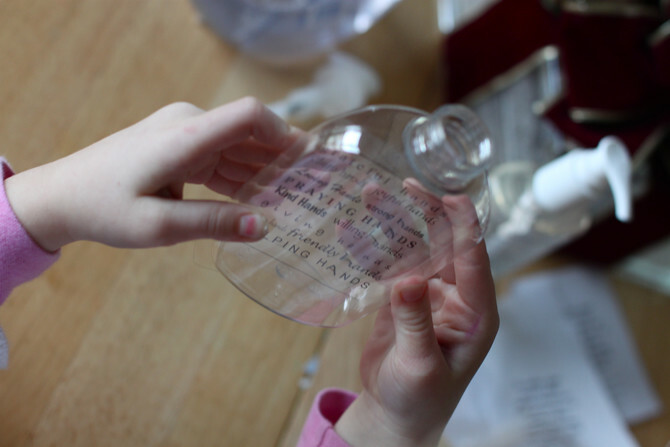 Let little hands help you roll the transparency piece and drop into the empty bottle. If your soap dispenser is already filled, skip below to number 3. 3. Now for the soap. 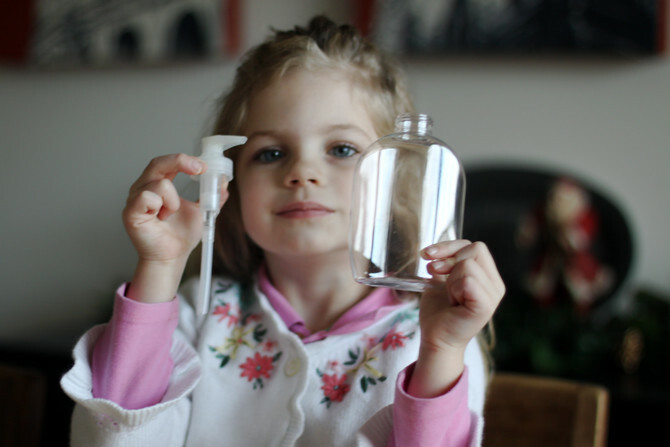 If you're pouring soap into your bottle, tilt the bottle so that the transparency piece lays against the front of the bottle. The bottles that have the text right up against the front of the bottle look the best. Fill the soap behind the transparency until it stays in place. Finish filling and twist on pump. 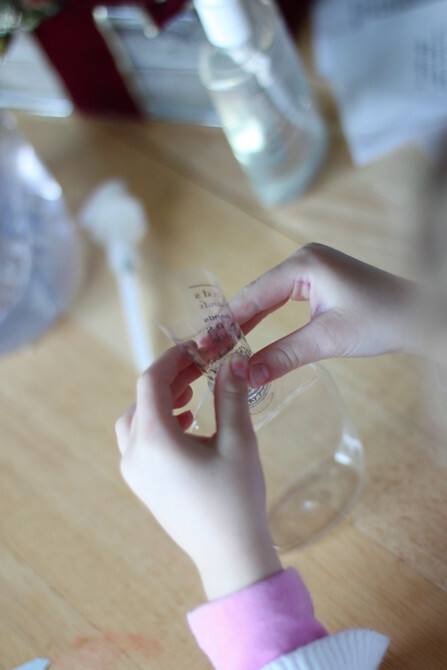 If your bottle is already filled with soap, roll up the transparency to drop in but have a long cuticle stick handy to help you push the transparency to the front of the bottle as best as possible. The cuticle stick can also be used to make sure the text is lined up just right. 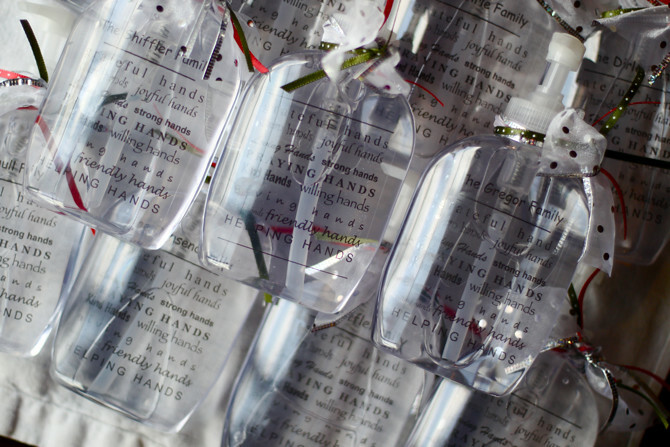 Once you have all of your bottles filled, embellish! A little bit of ribbon does a lot. What do you think? Isn't it the coolest, simplest idea?